I haven't been paying much attention to events in DC's New 52, but the final panel of Batman #28 sucked me back in! 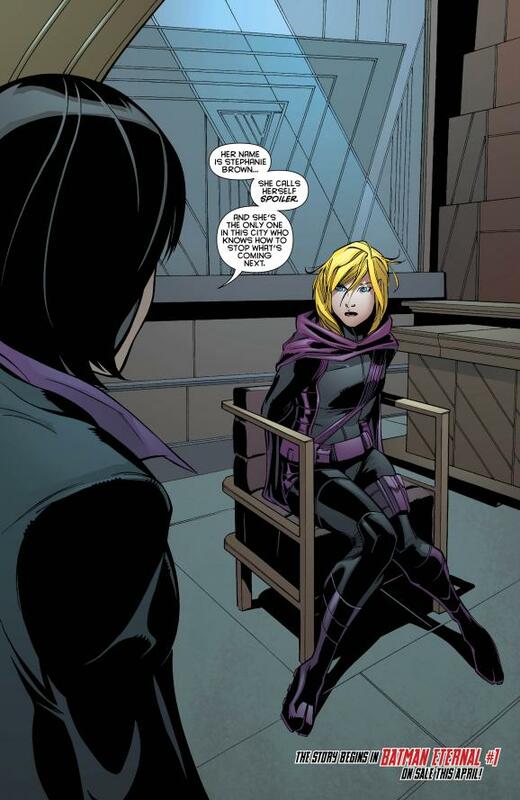 Stephanie Brown is back, but this time in her original guise as Spoiler! Apparently Batman #28 was a genuine "spoiler" issue, because it jumped ahead six months in the timeline, and we won't find out what happens next in at least six months, I guess. While this is Stephanie's first appearance in The New 52, we won't see more of her until the weekly series, Batman Eternal starts in April, with her first appearance in issue #3, the week of April 23rd.